The governor of Abia State, Dr Okezie Ikpazu wants to showcase his joy over the military invasion of Mazi Nnamdi Kanu’s home as he wants to tap into Kanu’s wealth of ideas. According to the information reaching the desk of Abia Writers, all the markets in Abia State will be shut down on Thursday the 14th of June 2018 for a Ten million man match ordered by the State governor, Okezie Ikpeazu. His mission is to command a mammoth crowd just like the leader of the indigenous people of Biafra, Mazi Nnamdi Kanu, to tell the world that he (Ikpeazu) is the peoples' choice. 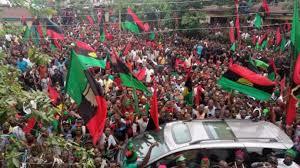 IPOB leadership under Mazi Nnamdi Kanu has earlier declared that there will be no voting in all parts of Biafra land if Nigerian government and the Southsouth and Southeast governors and leaders refuse to grant IPOB request for a referendum. That was the major reason they connived with the federal government to kill Mazi Nnamdi Kanu and continue with their business as usual electoral system. The self-acclaimed lgbo leaders claim that the IPOB leader, Mazi Nnamdi Kanu, is not intelligent but they keep borrowing from or reacting to the same intelligence they claim he doesn't have. 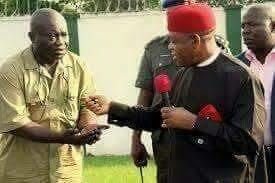 Take for instance Kanu talked about referendum; Ohanaeze Ndigbo reacted to this idea to talk about restructuring. He commanded Ten-million man march and the governor is now buying his idea to try to organize the same kind of March for his selfish purpose. The truth remains that Ikpeazu will fail woefully before the eyes of his evil Masters because the people have chosen not to remain in one Nigeria again but to be totally free from Nigeria. Nnamdi Kanu's way about is the most important thing to discuss now, and not campaigning for someone who is not interested in the people's affairs. Nnamdi Kanu remains the only leader and representative of the people and the only person that can command or give orders that the people will obey.